1. You have an inappropriate attachment to Monopoly. You know it’s bad when you hold up Monopoly as the paragon of a “real game” to your kids (unlike that “junk” they play on the computer). As a recent article in Wired magazine points out, Monopoly is actually a really stupid game because the only strategic question is “buy or not buy” and you spend the whole time trying to reduce your opponent to dust. And yet, I still find myself oddly drawn to the role of deeder (or whatever you call that person who hands out the properties). Then again, my conception of a video game doesn’t extend much beyond Pacman, so maybe that’s what I really ought to be concerned about. 2. You still buy candy necklaces. And eat them. What? Am I the only one who does this? 4. You wish you had a mood ring. Remember those? The ones that told you what mood you were in by the color of the ring? Mine always seemed to be black, which I think meant “nervous.” Pretty much tells you all you need to know about my childhood. 5. You still find yourself attracted to Luke Skywalker. My son had a play date recently with another little boy and they started arguing over whether or not Anakin Skywalker was ugly. (Read here for a great article by Slate’s Emily Bazelon about the enduring appeal of Star Wars for little boys.) I suddenly felt compelled to jump in and defend Luke’s looks. The little boy turned to me and said: “Oh! Do you fancy Luke? He looks very smart.” At which point I had to admit begrudgingly that, yes, I do in fact fancy Luke. In case you missed it – and because it’s already making the rounds of the Mommy Blog circuit – here’s a link to Ayelet Waldman’s remarkably candid interview on National Public Radio’s Fresh Air with Terry Gross, where she talks about her new book, Bad Mother. 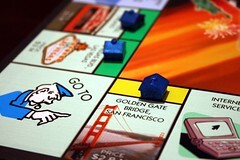 Image: New Monopoly Board by Vinduhl via Flickr under a Creative Commons License. Today is a bank holiday over here in the U.K., so I’ll be back posting tomorrow. In the meantime, and further to Friday’s post about the road not taken, a friend sent me a link to this website where you can register a regret and see how many people share it or search for one of your own. Fun stuff! What a great quote that is. I’ve been thinking about regret lately. It all began with this touching piece by David Sedaris in The New Yorker a few weeks back. Sedaris writes movingly about a near-hook up he almost had in his early 20’s with a Lebanese guy whom he met on a train in Italy. Although the guy invites Sedaris to get off the train and join him, Sedaris passes on the opportunity. But he still thinks about that guy – and what might have been – all these years later. The essay is a giant homage to that great question of adulthood: What if? Mamma Mia – and I’m not spoiling anything here – is about a young woman on the brink of getting married who doesn’t know who her father is. So (unbeknown to her mother) she invites the three likely candidates to her wedding. Passion, longing, anger, resentment (and far too many Abba songs) ensue. The movie is all-out camp, but nestled within all the cheese are a few touching moments that actually work (Meryl Streep singing The Winner Takes It All to a love-struck Pierce Brosnan was my own personal favorite). What Sedaris’ essay and Mamma Mia have in common is wistfulness, which is a huge part of adulthood. In Sedaris’ case, it’s not that he regrets whom he ended up with. (He makes a subtle nod to his long-time partner, Hugh, at the end of the essay.) It’s just that he’s wondering if – in turning down that handsome Lebanese guy all those many years ago – he missed the boat. Not necessarily the boat, but a boat nonetheless. And in so doing, he articulates that great fear of adulthood: which is that once we make a choice, everything else becomes path dependent. Which in turn forces us to come to grips with the fact that we may never go round again. This can be a fear about your personal life, as it was in these two instances. But it’s also a fear that we bring to career choices and to where we live and to the schools we attend (or don’t). What I find moving about wistfulness is that you can’t really escape it. You need to just live with it and perhaps, even, embrace it by – say – writing a short story in the New Yorker. On a lighter note, midway through the movie – which is shot on the Greek islands – I commented that I’d like to go to Greece. To which my daughter replied: “OK, but let’s not go to Latin.” No, indeed. Let’s not. Speaking of musical theatre, is anyone else as excited as I am that they’re making a movie about the making of A Chorus Line? OK, anyone who isn’t my sister? I had another Barry Manilow moment the other day – i.e. one of those times when a snippet of music or cultural reference or, in this case, specific location instantly transports you back to some signature moment in your journey towards adulthood. An article I was reading about an art show in the United States referenced an up-scale art gallery on Eastern Long Island where I once worked as a waitress during high school. And all of a sudden I was hit by a wave of nostalgia. I worked at this place for only three or four weeks one summer with my older sister. We worked Thursday-Sunday nights serving desserts to the clientele of the gallery. But while short lived, that job proved to be one of those searing professional experiences that stayed with me for years. Why? Part of it was the gallery owner himself: a high strung Manhattan transplant who tried to mask his OCD-like tendencies behind flashy shirts and purple trousers. I think he thought that running a shabby-chic, beach-side gallery would render him a mellower soul. It didn’t. Learning how to manage a mercurial boss proved to be a life-long skill I started cultivating that summer. It was also the first time that my sister and I – separated by four years in age – became friends instead of just sisters. Having a common enemy in the form of Mr. Purple Pants really united us. I can still remember her emerging from the kitchen with a blob of whipped cream on her face, the remnants of which had been pilfered from a passing profiterole. That didn’t go down very well with our boss, but I erupted in peals of laughter. That sort of fraternal camaraderie between co-workers has been absolutely crucial to every job I’ve held since. And, then, finally, there was waitressing itself. Someone once told me that everyone should be required to do three things in life: wait tables, answer telephones, and I can’t remember the third – it might be working construction. There’s something about learning how to navigate the combination of a persnickety boss, demanding customers, and time sensitivity all at the same time – with, in this case, a prima donna pastry chef thrown in for good measure – that really serves you well in whatever you go on to do next. Turns out, my sister and I were pretty bad at waitressing. We were always getting the orders mixed up, or naively revealing to the customers that, sadly, we’d run out of regular coffee. (“Serve them the %$! * decaf!” our boss hissed while smiling unctuously at the clients). And I think we both decided that the world would be a better place without us waiting tables in it. And yet, twenty five years later, just the mention of that gallery brought all of this flooding back to me. Which has to be a good thing, right? If nothing else, I’ve never looked at a cup of decaf quite the same way since. Nostalgia is a huge part of growing up. I talked about it vis a vis my re-reading of Peter Pan the other day, and I’ll have more to say about it on this blog another day. Today, however, let me address one tiny sliver of the nostalgia theme that’s been on my mind lately: the nostalgia inspired by music. It all began when my husband suggested that we watch a Barry Manilow concert on television the other night. Before you click away from this blog in disgust, allow me to defend myself. Yes, I admit that he can be horribly cheesy. And I wouldn’t ever call myself a “fan,” despite an abiding fondness for Copacabana…(have a look at this video and tell me you’re not already singing along. I’m a sucker for the part where Lola loses her mind). In all seriousness, though, the man knows how to tell a story. But this isn’t about Barry Manilow. It’s about that special feeling of nostalgia that’s engendered by hearing a song from your past that means something to you, or calls to mind a particular moment when you were growing up. Yesterday, the London website Alpha Mummy was up in arms over an outrageous Mother’s Day marketing ploy by British supermarket giant Sainsbury’s – the store is marketing a CD called 101 “Housework Songs” (Mother’s Day is celebrated this Sunday in the U.K.). In response, Alpha Mummy posted a hilariously clever “Top 10 Songs to Listen to While you File a Letter of Complaint to Sainsbury’s.” While I thoroughly enjoyed the post, I was also amazed at how many of the song lyrics they referenced I could recite by heart. Because they take me right back to…ya know…the old days. And then I stumbled across this website, aptly named Songs You Used to Listen To, where each day brings you a new song from the past.